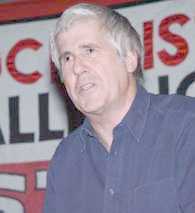 Despite coming from a ruling-class background, Paul Foot broke politically with his class and became a revolutionary socialist while working as a young journalist on the Daily Record in Glasgow. He became one of the finest investigative journalists of his generation and was responsible for exposing corruption in high places and the blatant injustice of the British legal system. He was a great populariser of the socialist message both in print and in person at innumerable meetings up and down Britain. He also published a number of important political studies (e.g. on Harold Wilson and Enoch Powell) as well introducing a new generation to the revolutionary message of radical poets such as Percy Shelley and William Blake. In 2000 he received the Journalist of the Decade award in recognition of his principled struggle against injustice. This archive attempts to provide a glimpse of all aspects of his political work. The Rotherham lads are here! Shirley, Shirley, quite contrary, how will your garden grow? Will Labour make a difference? Arms dealing: Will they get off Scott free? When will the Blair bubble burst? Treated for health or for wealth? Election: Is this what democracy looks like? Corruption: Who Said Crime Doesn’t Pay?